The Rams have two of the NFL's 10 best interior pass rushers this season. So this isn't a great time for the Vikings to be coming off an abysmal game from their pass protectors. Only one NFL team features two of the league’s top 10 interior pass rushers through three weeks of the season — the L.A. Rams, whom the Vikings are set to play at the Coliseum on Thursday. So it’s not a great time for the Vikings to be coming off of an abysmal game from their pass protectors and, subsequently, their quarterback. Keep in mind the upcoming matchups against Rams defensive tackles Aaron Donald (15 pressures) and Ndamukong Suh (11 pressures) during this breakdown of the Vikings’ issues in a 27-6 loss to the Bills on Sunday. 1. The pressure affected quarterback Kirk Cousins, even when he wasn’t pressured. Cousins’ horrific start started with missed throws and continued with the Vikings offensive line. First, Cousins overthrew an in-and-out corner route to receiver Stefon Diggs. Then Bills linebacker Lorenzo Alexander walked right guard Mike Remmers into the backfield, forcing Cousins to scramble on the first fumble. Center Brett Jones followed with a poor block on Bills defensive tackle Star Lotulelei for a no gain by Mike Boone. The ensuing 3rd-and-8 saw Bills defensive end Jerry Hughes twist by left tackle Riley Reiff for the second strip-sack. Cousins’ three fumbles Sunday give him 34 fumbles since 2015, the most in the NFL tied with Seahawks quarterback Russell Wilson. It continued to spiral out of control as Cousins overthrew receiver Adam Thielen on a 3rd-and-5. “I tried to throw it over the underneath defense,” Cousins said. “I just think I maybe gave them too much credit to how much they were dropping.” One of the most egregious errors came deep into the second quarter, when Cousins had already been sacked three times and trailed 27-0. This time, he had a clean pocket on 3rd-and-7 when he overlooked an open Diggs on the corner route and opted for the underneath to Thielen, who dropped the pass short of the marker. This isn’t Washington’s offensive line, and Cousins knows full well heading into Thursday night’s game against the Rams with Donald and Suh. Cousins’ 2.36 seconds to throw was his fastest through three games, and quicker than he’d thrown in all but three games for Washington last season, including both games against the Eagles’ rush, according to Pro Football Focus. Cousins’ average time before throwing with the Vikings is now 2.43 seconds, compared to his season averages of 2.52, 2.68 and 2.50 during his three seasons as Washington’s starter. 2. Pass protection leaks sprung from everywhere, but no more than from left tackle Riley Reiff. He was pegged with a league-high 12 pressures allowed, according to Pro Football Focus, as he struggled mightily with Bills edge rusher Jerry Hughes. 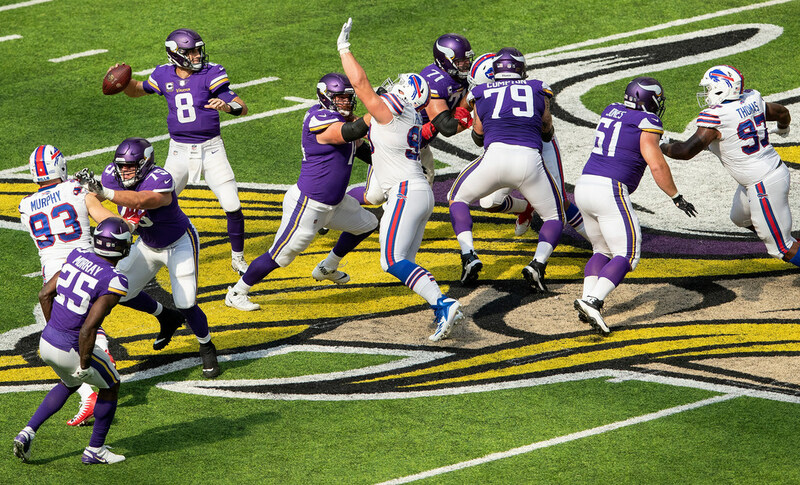 Remmers also had a forgettable day, surrendering the initial pressure on Cousins’ first fumble, the sack to Bills defensive tackle Kyle Williams and he was overpowered by defensive tackle Harrison Phillips on a one-yard loss from Latavius Murray. Running back Mike Boone whiffed on a blitz pickup during the fourth sack of Cousins. Center Pat Elflein made his debut on played 22 snaps, entering in the second quarter. He was an immediate improvement, even if his biggest blunder was a bad shotgun snap to Cousins’ right leading to the third fumble. The Bills were aggressive in play and game plan, sending extra rushers on six of Cousins’ 17 dropbacks in the first half. Cousins completed 4 of 6 passes for a total of 14 yards on those plays. On defense, the Vikings also blitzed six times in the first half and couldn’t get home on any of them. Bills quarterback Josh Allen moved the chains on two of the six plays, had two balls dropped and set up a late field goal on another with an 11-yard gain on 3rd-and-20. 3. Anatomy of a play: Without the NFL’s former elder defender, Terence Newman, roaming the slot, there have been a handful issues involving the Vikings’ slot corners lately. This 2nd-and-11 below, when the Vikings still had a chance, might not be on corner Mike Hughes. But the rookie was involved in a mix-up that led to Bills tight end Jason Croom running wide open for a 26-yard touchdown in the first quarter. Once Bills running back Marcus Murphy began motioning toward the flat, Hughes said Monday he signaled to linebacker Eric Kendricks that he’d pick up the shallow route by Murphy. Instead, both Kendricks and Hughes jumped on it. Allen kept safety Andrew Sendejo guessing with a post route crossing Sendejo’s face mask. 4. The Vikings didn’t plan well enough for Josh Allen’s mobility. Allen, the 22-year old in his second career NFL start, showed remarkable decision making on when to take off and run. His 10 carries netted six successful plays, starting with his 10-yard touchdown run beating linebacker Anthony Barr to the pylon. His next run didn’t come until an ensuing 3rd-and-9, when he hurdled over Barr (6’5″) for a 10-yard gain. Allen escaped the Vikings’ pass rush a handful of times, including an 8-yard scramble on a 3rd-and-6. Allen made some plays, but benefited from a Bills game plan that threw in run-pass options and other easy completions. First came the pick play when receiver Kelvin Benjamin shielded Barr to free the running back for a 9-yard swing catch. Then came the tight end slip screen for 13 yards. Throw in the Vikings’ penalties and you had a nightmarish day for the defense. The Vikings were penalized six times — three on defense, three on special teams — and all six came before the 12-minute mark in the second quarter. Barr’s horse-collar tackle on Allen and nose tackle Linval Joseph’s lowering the helmet on Allen gave the Bills 30 yards on the opening touchdown drive. Joseph’s flag negated what would’ve been a three-and-out to start the game. 5. The Vikings need more from Barr and Kendricks. Barr tackling high on opponents created two penalties, including the aforementioned horse-collar tackle and a 10-yard face mask penalty when tackling Chris Ivory on a six-yard catch. Kendricks might be the most underrated defender for the Vikings, perhaps only behind the guy taking up double teams for him in Linval Joseph. 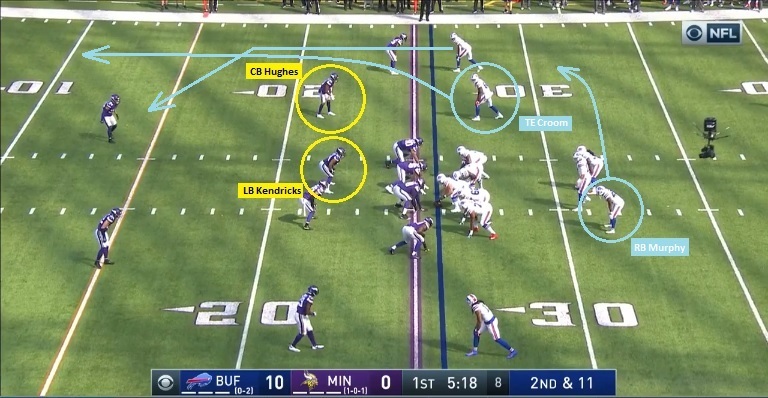 But there were two clear miscommunications with Kendricks and the slot corner: Croom’s 26-yard touchdown and Ivory’s 55-yard catch and run when both Kendricks and cornerback Mackensie Alexander defended the tight end on a broken play, leaving Ivory to run free behind both while Allen scrambled. Barr’s first half included the two penalties, Allen’s 10-yard touchdown run to the pylon and Allen hurdling him on third down.